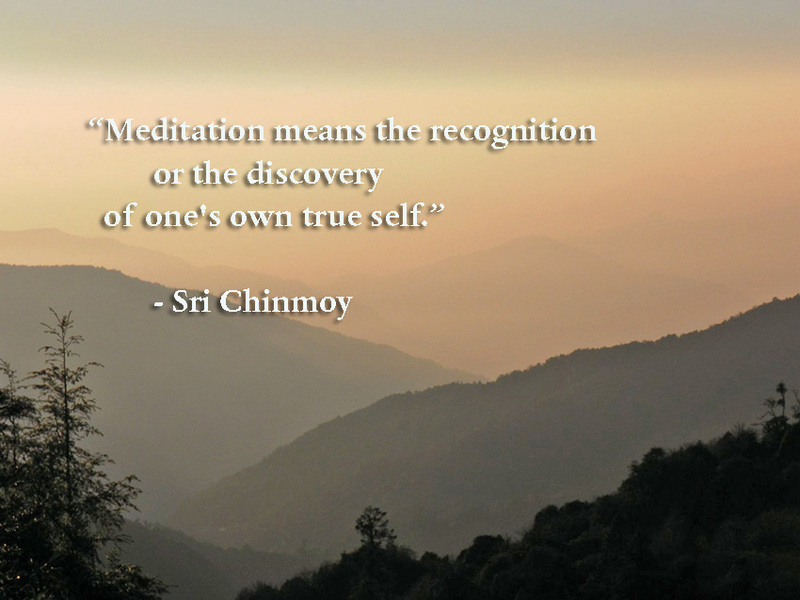 My meditation teacher Sri Chinmoy gave many different meditation techniques, but also suggested that the real secret of meditation was – not just mastering technique – but our heart’s inner cry. If we are satisfied with what we have in the material world, then our meditation will not be very deep. However, if we feel a deep inner cry for peace and joy, then whatever technique we use we will be able to make faster progress. Nevertheless, these are some techniques which I find helpful and use in my own meditation. During the day, when the outer world is a little more restless, I like to repeat a mantra. I use ‘Supreme’ which is a term Sri Chinmoy uses to describe God in his ever transcending aspect. By repeating the mantra Supreme, I feel it is both meditation and invocation. I try to repeat the mantra in the heart, to try and awaken the heart chakra. It is often recommended to count a certain number of mantras 500, 600, 700. However, although I often use mantra beads, I don’t tend to count. I start off relatively fast, but try to repeat the mantra more soulfully and with more awareness. For me the goal is not to achieve a certain number, but to say more soulfully and without any mental distraction. Trying to meditate in the mind is difficult because the nature of the mind is to produce thoughts. If we can move away from the mind to the heart, then we are in a better place to meditate. Whatever technique of meditation, I usually try to be in the heart; there is a good spiritual energy there. If you really concentrate on the heart, you can start to feel your sense of being shift – from the head to the heart. To quieten the mind and thoughts, conscious breathing is very effective. I sometimes use a simple 1,4,2 breathing exercise. Inwardly repeat a mantra once, whilst breathing in. Then hold the breath for four counts, then count twice whilst exhaling. Breathing affects our though currents. Slowing down and deliberately breathing calms the production of thoughts. After a time, you can try to maintain this breathing exercise without repeating any mantra, but just maintain inner silence. 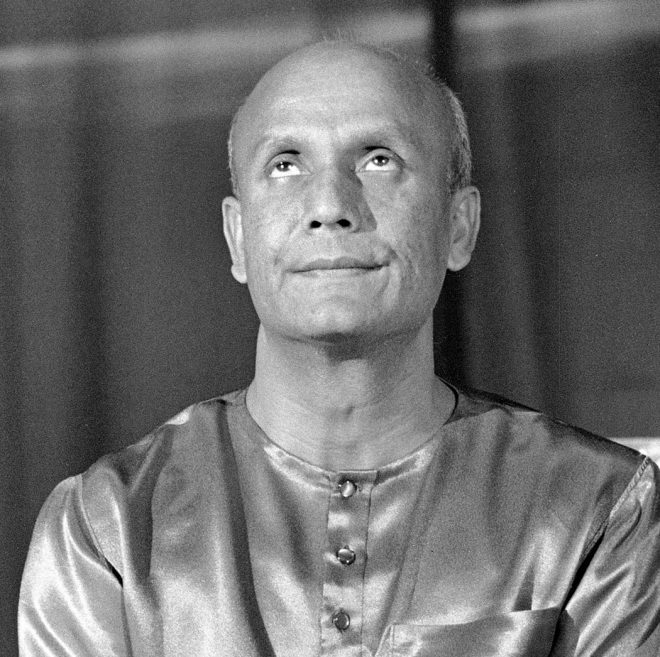 For myself, I like to meditate on a picture of Sri Chinmoy, taken whilst in meditation. When a yogi is in meditation, the consciousness is to an extent visible in their eyes and face. It can give inspiration and confidence that the goal of meditation is achievable. The only difference between a yogi and ourselves is that a real yogi is aware of who he really is. His Transcendental consciousness becomes part of his identity here on earth. We have this Higher self, but at the moment we are not fully aware. This is why it is a helpful to associate with those who have realised their true nature. You can choose any picture or statue that inspires you. We have a capacity to manifest our strongest thoughts and convictions. If we live a life of pleasure seeking, this is that will dominate our awareness and reality. But, if we try to be always conscious of the ultimate goal of meditation, then we create strong seed thoughts to bring it closer to us. For example, we can pass a tree and see just another tree, or when we pass a tree, we can try to feel its living spirit and its own connection to the Source. If we see a beautiful sunset, if we feel grateful to the Source for the beauty of nature, this constant awareness of God helps us to be more conscious of the goal and in the long term will make our meditation more effective. To help cultivate an awareness of the highest goal, I sometimes find it helpful to mentally repeat this particular mystical poem. It is a poem which expresses the heights of meditation. If we say it in silence, very soulfully and try to feel its real meaning, it can remind us of the lofty goal of meditation.